French diplomacy in East Asia has been proceeding apace. Last month’s visit to North Korea by special envoy Jack Lang seems to have borne fruit: Paris announced it was on track to set up a liaison office in Pyongyang for economic, cultural, and linguistic exchange as a step toward full relations with the DPRK. Lest this step be ridiculed, it’s worth considering that the Obama administration has now announced its interest in following a similar path with North Korea. There have indeed been fences to mend in France’s diplomacy in Asia. In the case of North Korea, six decades of estrangement as a result of the Korean War; in the case of China, twenty months of recent controversy and more than a century of perceived bullying. Sure, there have been bright spots along the way: Charles deGaulle’s recognition of the PRC in 1964 was seen as a real affront to the “imperialist” United States, a move that simultaneously brought China and France into a mutual embrace while mocking American anti-communism. The Chinese may not like Sarkozy, but they do tend to recall deGaulle as a stand-up guy with bona fides from the Second World War and his willingness to later stand up to the United States. But remembering the Algerian War which China denounced at the time? Not so much. So, when French Prime Minister Francois Fillon showed up in Beijing this past week to sit in the obligatory overstuffed chairs, meet, drink tea, and ink deals, he stepped into a long line of Sino-French continuity. This is a big, complex, and mutually exciting and frustrating relationship, and this week appears to have been no exception. We know something already about the huggable and saavy Wen Jiabao, but who is Francois Fillon? BBC describes Fillon as “an old-school Gaullist,” a centrist figure, pro-business, and confidant of Sarkozy. The New York Times calls him a low-profile “coordinator.” His wife is Welsh and he has five children, perhaps remarkable. Most recently, he has gained some renown for his December 17 remark that “the burka is not welcome in France.” Presumably this type of remark does not go unnoticed by the Chinese government, which likely appreciates a bit of thinly veiled (if you will pardon the unintentional pun) anti-Islamic sentiment coming from its trading partners, particularly if said sentiment keeps them quiet on the subject of religious freedom in Xinjiang. What were some of the issues on the table for this trip and what does it tell us about China’s foreign policy? China remains exceptionally sensitive about French attention to, and adoration of, the Dalai Lama. There are few other countries in the world where His Holiness gets such renown and acclaim, and, thus, where the idea of Tibetan independence is taken so seriously. There are a growing number of Buddhist converts in France who follow the Dalai Lama’s religious teachings, which Beijing is, presumably also keeping tabs on. In February of this year we had the major imbroglio over the Yuanmingyuan statuettes, property representing part of China’s Qing-dynasty cultural heritage, which were auctioned off at the Paris Christies. This was a very big deal that added fuel to the flames of the Olympic Torch controversy (the Paris run was heavily disrupted by protestors) and pro-Tibetan actions taken in spring of 2008. All of this resulted in an attempted boycott of French goods by Chinese students and other generally nasty media denunciations. The French government has been trying very hard lately to steer away from the Dalai Lama and back onto the golden path of commerce. The Dalai Lama’s visit to Paris this summer was discouraged by Sarkozy and virtually the whole of his administration, which meant that the inviting Paris mayor bathed in the glow of some serious Chinese nationalism, as reported on this blog. For its part, China seems concerned that its exports to France are down sharply, and was looking to get some cooperation on a particular nuclear plant. Energy, aviation, cultural cooperation, and water conservation projects were on the table, and deals were inked. In other words, this was a trip about business. Xinhua summarizes the action here. Lest you imagine I am entranced by the orange and blue codex of Xinhua’s hypnotic English site, Le Figaro comes to the rescue again, since for some reason the New York Times is incapable of covering such stories. It was the one small false note in a successful diplomatic mission. 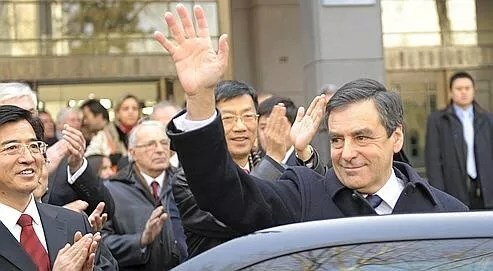 Standing in front of the students of Beihang [北航/North Air] University, François Fillon let slip a confirmation of the next visit of Nicholas Sarkozy [to China] in May 2010. “The reinforcement of the Sino-French relations will be symbolized in the venue for the inauguration of the Universal Expo in Shanghai at the beginning of May…by the President of the Republiic, Nicholas Sarkozy,” he said in a happy lapse. Destabilized for several seconds, Fillon rapidly put on again his diplomatic facade. After playing a game of avoiding the landmines of provincial autonomy, the Prime Minister won his diplomatic stripe. Over the course of two days, he spent some diplomatic capital in order to revive/warm up Sino-French relations after the imbroglio of the past year and a half. “I had as my mission to get Sino-French relations back on track. My mission has now been accomplished,” he rejoiced just after returning to Paris, a sentiment in accord with the coming week of vacation he will be taking in Austria. Very much at ease with his double role as diplomat and VIP, Fillon did not sulk in his pleasure [n’a pas boudé son plaisir] while posing in the midst of students of the Central Party School in Beijing who baptized their own promotions with the aid of the Prime Minister. This man, who is so miserly in giving insights into his private life, confided that his youngest son Arnaud (age 8) has begun to study Chinese. In other Sino-French matters, Aurnaud de la Grange reports that China has constructed since 1995 a 5,000 kilometer-long tunnel to store its various missiles. It makes you wonder: every time you think the North Koreans are the best in the world at something — like digging down into granite or making a somewhat less spicy kimchi that puts South Cholla to shame — the Chinese find a way to surpass them. I further suppose that once we reach Obama’s desired nuclear-free world, that, like the Cultural Revolution tunnels under Beijing, the tunnels for the missiles will someday be a quaint tourist attraction for happy Indian-Pakistani couples who hold hands and walk through in wonder that we, as a species, were ever so insane. Air France offers 500-yuan discounts to Chinese students of the French language for flights to the motherland. On the cultural front, a group of Francophone rappers made a tour through China this past March (which I sadly missed!). Chroniques Chinois, a sporadic but pretty solid French blog about China, carries a review of the show and, to my excitement, speculates that the Chinese hip-hop wave may ultimately carry to North Korea. How about French rappers in Pyongyang? Jack Lang, the point man for French North Korea relations, is already a kind of connaisseur of the art. More Le Figaro stories on Fillon’s trip are available here (on the climate issue) and here (on the emphasis on business interests at the expense of human rights).